Nathan Fillion has post-Castle plans, for what typically would have been his first day back at the ABC series’ set. And those plans are pretty…. hairy. Speaking with Michael Ausiello at TVLine’s Comic-Con studio presented by ZTE — where he and Alan Tudyk were promoting Con Man, their web series about a sci-fi actor’s adventures on the convention circuit — Fillion questioned if there was any way to have a “proper send-off” (versus down-to-the-wire cancellation) for a series, after eight years. “[I’ve worked] with amazing people that I love so very, very much… [and] I’ll miss them dearly,” the actor said. 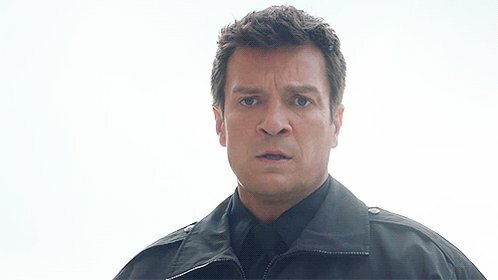 “But its been eight years since I haven’t had a plan” for that first Monday after Comic-Con, when production on Castle traditionally resumes. Fillion also confirmed that the Beckett- and Stana Katic-less Season 9 — had there been one — would have picked up after a meaningful time jump. And as for his all-time favorite memory from his eight years on the show… well, Tudyk gives him a little help with that one.